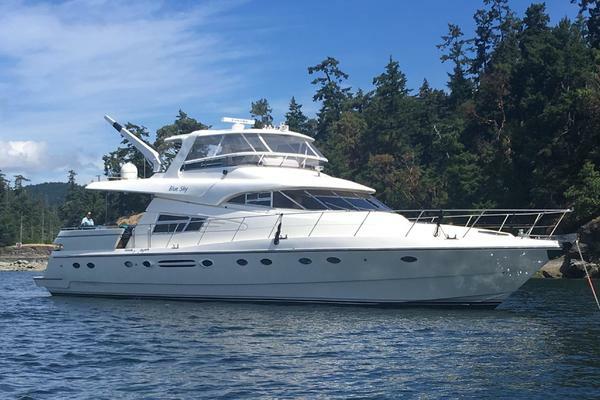 West Florida Yachts would love to guide you through a personal showing of this 85' Offshore Yachts Voyager 2007. 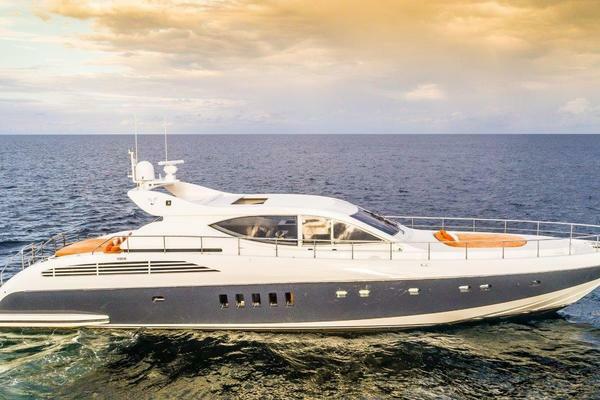 This yacht for sale is located in Bahamas and priced at $3,150,000. For a showing please contact us by filling out the form on this page and we will get back to you shortly! • Aft deck engine and thruster controls, rudder indicator and engine start‐stop switches• Port and starboard Clear‐view wing doors with 316 stainless steel frame• Stairway access to lazarette and crew cabin from aft deck or salon• FRP molded bench seat with built‐in gasoline tank for tender, sight gauge, and 15' hose• Two aft deck tables• Under counter refrigerator• Covered FRP sink with corrosion resistant pull out faucet• Two aft deck flood lights mounted on boat deck overhang• Hand held shower with corrosion resistant pull‐out faucet• Fresh and salt water washdown at stern• Custom SS hinged doors with “Offshore logos at swim deck stairs• 316 stainless steel pop‐up cleats at sport deck mounted under outboard stainless-steel U‐rails• Concealed 316 stainless steel built‐in swim ladder at sport deck, hinged to 25 degrees for easy boarding• Poly planar waterproof speakers in Cal Deck overhead with volume control• Color camera at aft deck• TNT tender lift at transom for 17’ tender, and recreation/dive platform.